Larry Pacifico, first powerlifter to make the cover of Iron Man. Succasunna, New Jersey, was the scene of a recent, highly informative seminar conducted by Larry Pacifico and Bill Pearl. It was held prior to the Mr. Appalachia bodybuilding contest. Approximately 150 lifters, bodybuilders and coaches attended the informal, question/answer session. 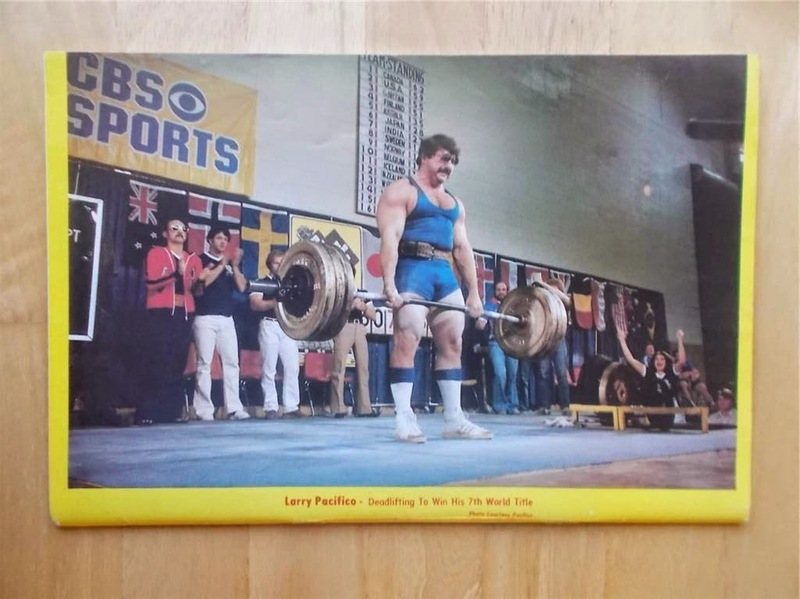 At the request of Peary Rader I will discuss the thoughts of Larry Pacifico, nine times world powerlifting champion. Pacifico is as articulate as he is visually impressive. His ideas are sound, yet enlightening. Concerning his overall training routine, Larry noted that he works four days per week, performing the bench press and squat in a 10-8-6-4 warmup progression followed by a heavy workload of 4 sets of 3 reps with progressive weight increases. He then concludes with 2 sets of 8 reps for a flush. Note that he does not do single reps, although he will occasionally work doubles; similarly, he will not go for a single rep maximum in the gym. Very attuned to psycho-motor interaction, he goes for max only during meets, rather than risk a psychological defeat in the gym. Larry's deadlift is worked in 4 warmup sets of 6 reps followed by 4-3-2 heavy reps. In the week before a contest, Pacifico does not totally lay off, but rather works lighter, going no higher than his planned opening lift. He supplements all of the above work with bodybuilding, isolation-type lifting. For example, Larry adds front and back shrugs for the trapezius muscles and performs straight-legged (not stiff-legged) deadlifts to augment his competition deadlift. To supplement the bench press, he will add dips, which he considers to be the main accessory work for the bench, and flyes, thus dispelling the question that flies detract from bench press performance. He also uses a 'bodybuilder bench press' wherein the spotter will lower the bar to the lifter's neck and the lifter must press it from there. He also likes lying triceps extensions with an EZ curl bar lowered to the face and then back up. Concerning sets and reps, Pacifico notes that one should select 2 or 3 exercises and work 7 to 9 sets per bodypart for 5-7 reps. Larry feels that in performing a rep-set the lifter should maintain a certain rhythm, one should not stop between reps as if he were doing a series of single repetitions. Pacifico also likesto rest about 3 minutes between sets, contrasting this with the conventional thinking of 30 seconds between sets in a bodybuilding routine. 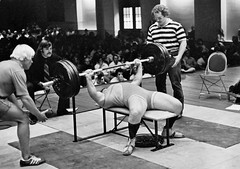 In answer to a question on sticking points in the bench press, Larry offered the following suggestion: a two-week layoff from benching; if the problem is particularly stubborn, while employing a supplementary program of dips, flyes, and especially isometrics held for two-to-six second counts at the sticking point and two other points along the bench press stroke. Concerning the tricep-bench press conflict, Pacifico feels that if you work the bench press on one day and the triceps on another, provided the latter is worked on the day after benching, not before it. Pacifico emphasizes the necessity of knee wraps for the squat, especially for those lifters with a close stance. He theorizes that no deep squats should be performed by lifters below the age of 17, preferably age 21. He further emphasizes that squatting is a must for all athletes and for leg power. As can be seen, much of what Pacifico describes is of a bodybuilding nature rather than pure powerlifting material. He openly states that this is essential. One of the main reasons why powerlifters injure themselves is that by working only the three competitive lifts - bench press, deadlift, and squat - the smaller extraneous muscles become neglected, lagging behind the larger muscles. When this happens injuries occur due to the inability of the smaller peripheral muscles to support the weight demanded of them. Thus, with bodybuilding work he can isolate and develop those smaller muscles. In fact, when taking a layoff - Pacifico advocates a 6-week layoff every 4 months - he merely switches from a powerlifting routine to bodybuilding. Larry will also use Nautilus-type variable resistance machinery, especially the pullover and leg machinery, during this phase. As mentioned, Pacifico's ideas are sound, concise, and widely applicable. His contributions to the clinic, as well as those of Bill Pearl, led to an outstanding presentation. This is exactly the sort of clinic that weightlifting-powerlifting-bodybuilding needs. Thanks and recognition should be bestowed on Mr. Bill Percy of Image Productions, Inc., Succasunna, New Jersey for this outstanding event.